“Die drey scheenschte Dääg” (“the three most beautiful days”), is the nickname that the people of Basel give to their most beloved tradition, the Basel Fasnacht, or Basler Fasnacht to give it its correct German name. This is our guide to the Basel Fasnacht including the full order of events over the three days of the carnival itself. In German-speaking Switzerland and across parts of Germany, Fasnacht refers to the annual carnival. Basel Fasnacht, the most famous of the Swiss carnivals, takes place every year in the week after Ash Wednesday and goes on for exactly three days. Like all of the traditional carnivals, the Basel carnival has its roots in the Catholic festivals that mark the start of Lent. The Carnivales of Latin America, including the Mardi Gras in Rio, have their origins in the same traditions. Tens of thousands of spectators come to Basel to see the biggest and most elaborate carnival in Switzerland. About 12,000 people take part in the Fasnacht itself. Participants are always costumed, and many are dressed as the most famous symbol of the Fasnacht Basel – the Waggis. The Waggis costume, with its big-nosed masks and floppy, brightly coloured masks is a satirical symbol of the people of Alsace. Morgenstreich: 11th of March 2019; Exactly at 4 am. Cortege Basel: 11th and 13th of March 2019; On both days at 1.30 pm. The Basler Fasnacht 2019 will end on the 14th of March exactly at 4 am. In 2017, Basler Fasnacht was inscribed on the UNESCO Representative List as being part of the Intangible Cultural Heritage of Humanity. 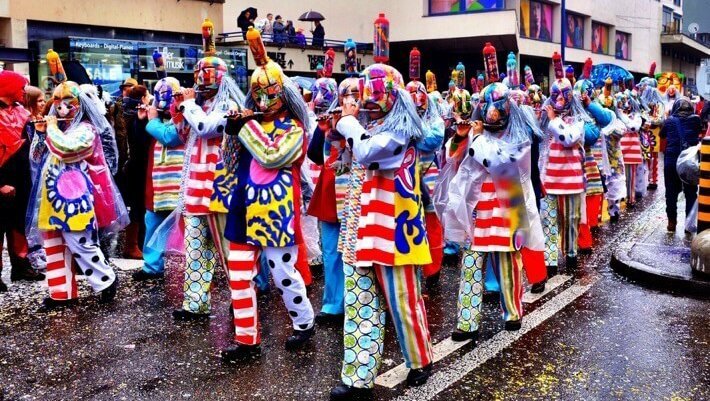 This was in recognition of the long-held traditions of the Basel carnival, together with the efforts undertaken by the participants to ensure that these traditions live on throughout the generations. In addition to this, the Basel Fasnacht also helps to ensure that local Baseldytsch (written and spoken local Swiss German) dialect survives. So what exactly happens at Basel Fasnacht and why is it so important to the people of Basel? Well, this Baselstättler shall explain it all. A Waggis gives some sweets to a child. Basel Fasnacht has many activities that take place before and after the actual carnival itself. For me, the Chienbäse is always the kick-off for the carnival time. The word itself originates from the Alemannic German word for “pinewood besom”, which is set alight in various forms during the festival itself. It’s quite the spectacle when the participants, carrying burning bundles of pinewood chips, are walking through the city of Liestal (capital of Basel-Land). In more recent decades, there are even carts carrying bonfires through the centre of the town. It’s difficult to get decent pictures of the Chienbäse with the light, however, we made a short video (less than a minute) so you get the picture. The flames can go to the height of a house and the burning carts pass within inches of the enthralled crowds. My personal highlight is when the carts have to speed up when are running through the city gates, which are also doused in water so that the wooden parts of the ancient gates don’t catch fire! The reason for the festival is to chase away the cold of the winter and welcome in the spring. It has been celebrated in Liestal since 1902. It always takes place on the Sunday night after Ash Wednesday. I can recommend an early arrival to get a good enough spot for a front-row view. The best places, in my opinion, are either in front of or behind the city gate in the south of the city. At exactly 4 am on Monday morning, all the lights in Basel go off in preparation for the first parade of Basel Fasnacht, the Morgestraich. Two hundred lanterns, many over 3 meters high, are paraded in a route around the city centre, to the sombre sounds of the drums and flutes. Try to be there at least 30 to 45 minutes earlier as there will be another 20’000 people who want to see it as well! There is a special button with which the industrial works of Basel (IWB) can shut down all the public lights. The windows of buildings that don’t turn off their lights are normally painted black by Basel citizens who are annoyed at the lack of respect for this most sacred of traditions! The only lights remaining by the time the parade starts, are the lights of the lanterns of the Fasnächtler (active participants of the Basel Fasnacht). The lanterns are decorated with images that are different each year and often make satirical references to news and political events. On the command “Morgestraich, vorwärts marsch!” (Morgestraich, forward march!) from the drum major, all the Cliques (groups of carnival musicians) start to play their instruments and march. The brass bands you will see elsewhere at Fasnacht with trumpets and heavy drums known as Guggenmusik are not allowed during the Morgestraich. For a lot of people, the Morgestraich is the highlight of the whole Fasnacht. After the Morgestraich, you can get yourself a snack in one of the restaurants or Cliquenkeller. They are cellars where Cliques practice during the year and they transform to bars that also serve a simple food menu during the Fasnacht. Basler Mählsuppe (Basel flour soup) – like the name implies, one of the main ingredients is flour. Archaeologists have actually found proof that the Romans ate flour soup as long as 2000 years ago. In Basel it is a traditional meal for Lent, hence why it is eaten during Fasnacht. Ziibelewaije (onion quiche) – typical Basel Fasnacht dishes were originally peasant food and this is no exception. If there was any dough left from baking bread, people flattened this dough and used it as a base for a quiche. They then filled the pastry with whatever food they had left, which in this case was onions. Kääswaije (cheese quiche) – very similar to the Ziibelewaije above, made mainly of cheese though. Both quiches started out as peasant food but found their way to the palates of the middle classes very quickly. Nowadays as a Basler, you just can’t imagine going to Fasnacht and not eating at least one of each of the three dishes! Another great festival in Basel is the Basler Herbstmesse (autumn fair). Read more about it on our Insider guide to the Basler Herbstmesse or our Foodie Guide to the Basler Herbstmesse. There are two main parades of Basel Fasnacht. They are called Cortèges and take place on Monday and Wednesday afternoon starting at around 13:30. At least, that’s the official time, but most of the time it starts around 30 minutes later and goes for around two hours. In two different routes, all the participants will march through the old city. You will see the same cliques as at the Morgestraich with the piccolos and small drums. This time the Guggecliquen (cliques with wind instruments like trumpets) are also taking part. Wagecliquen (cliques who hand out oranges, flowers, sweets and also a lot of Räppli (smallest pieces of colourful paper) on hand-built wagons, mostly drawn by a tractor, are always surrounded by big groups of people chasing them down for a chance of grabbing some of their freebies. After the Cortège it gets a bit calmer. The Fasnächtler eat dinner with their cliques in their clique cellar and the spectators do the same. It never gets completely silent though as there are always some Schiisdräckzügli (non-Clique individuals and small groups, playing music with piccolos and drums) who gässlen (roam) the narrow alleyways of Basel. While the costumes during the cortèges are uniform within the different groups, the beauty of the Gässle is, that no one wears the same costume as anyone else. It’s a jumble of colours and sounds and there is always a slight melancholic touch in the air. My tip, especially for the Fasnacht evenings, is just to roam the streets and enjoy the spectacle. Try to find a spot in one of the Qliquenkeller and have a warming Mählsuppe. Celebrate the evening for example with a Waggis (white wine mixed with lemonade). Wondering who is underneath the masks? One of the strangest things is that nobody really knows who is underneath the masks except within the cliques themselves. Sarah was surprised to find out that quite a few of her colleagues from her corporate job participate in Fasnacht. Although she never knew if the Waggis who was currently throwing confetti over her was someone she knew or not! The Schnitzelbängg are satirical verses about current events in Basel and/or from around the world. There are quite a lot of Schnitzelbängg singers in Basel and they mostly come in groups of two. One person sings the verse in Swiss German and the other one shows the spectators matching illustrations. They always sing in Cliquenkellern. It can be quite difficult to actually see them as the places where they normally play are extra crowded. You can find them on Monday and Wednesday evenings. From Monday evening to Wednesday morning you can marvel at over 200 lanterns at the Münsterplatz. If you visit in the evening you can even see them lit. It is referred to as the largest open-air art exhibition in the world! As I’m a secret lover of art and an occasional painter myself, this is one of my highlights of the Basel Fasnacht. In the night from Monday to Tuesday, workers come out to clean the streets and it almost looks like nothing happened. But then in the afternoon, kids are taken to the streets and celebrate Chinderfasnacht (children’s carnival). It’s sometimes amazing how creative parents can be in building little wagons for their kids to draw them through the city. My parents did this with my brother and me several times when I was still a little kid. Needless to say that I absolutely loved it! I have to confess though, that nowadays I prefer to use this time to relax at home and be ready for the next big event in the evening. A Gugge is kind of a brass band and the Tuesday evening belongs to them. There are several stages on which the Guggenmusiken play. It’s even a bigger a spectacle to see them march in formation from stage to stage. You should really try to see at least one band, as the music will go right through to your bones. It’s loud, it’s fun and it’s definitely the highlight of Tuesday evening. You’re not a big fan of the Basler Fasnacht and want to escape the city during this time? Then why don’t you use the time for a Private Mount Pilatus Tour from Basel with Guide? The Fasnachtsmittwuch (carnival Wednesday) is almost exactly like the Monday (except that there is no Morgestraich). And then, after three days filled with music, laughter, masquerade and fun, Basel goes back to normal. At exactly 4 a.m. on Thursday. You want to know more about the Swiss city of Basel and why you should visit it? Then check out our other posts about Basel! Words in this post are in traditional Basel-German dialect, to stay true to the spirit of Basel Fasnacht. Switzerland has different German dialects depending on which canton you visit. Each is unique, so please don’t worry if the words seem different from any German you have ever learned before! If you are looking for ideas of what to do in the city beyond it’s biggest celebration, then check out our post on 20 Things to do in Basel – by locals! Use our deals finder to find the best offers on accommodation for your visit to Basel, or anywhere in the world! Have you visited one of the traditional Fasnachts or carnivals during your travels? Are you planning on visiting the Basel Fasnacht 2019? We would love for you to share your comments and experiences below! What a great way to welcome in spring. I’d never heard of a festival quite like this. The carts, the fires and the food all sound unique. I can see how a festival like this would give tourists a great insight into Swiss culture. Hi Carol, it really is a great start into spring 🙂 The whole atmosphere is very joyous. Thank you for your comment. Wow! Not quite sure I’d have ever guessed this was Switzerland. It looks more like the festivities you’d find for Chinese New Year or another similarly bright celebration. It would be quite the experience to have as a visitor with the locals. Those waggis remind me of similar characters who come around Christmas in Germany. Do you know if there’s any connection? Hi Jackie, unfortunately I never experienced any Chinese New Year festivities yet, but I guess they are quite different than the Basler Fasnacht. At the Basler Fasnacht the cliques are basically allowed to make fun of whatever they want and very often this is very politically 😀 I don’t think the Waggis have anything to do with the characters who come around Christmas in Germany as they symbolise the French people from the Alsace 🙂 Thank you very much for reading our post and have a fantastic day. This is one of the most unique carnivals that I have come across! All the rituals and the significances/stories are so interesting and vivid that I had to stop to re-read a few! Basel has surely a lot to offer. This is the first time I came to know about this place and what a way to get introduced! Adding to my list! Hi Reshma. The carnival in Basel is just amazing. For me it’s one of the must events in Basel and i’m probably going to miss it when we’ll be away for the next two winters! If you come to Basel for Carnival, just make sure you have some warm clothes. Hi Meg, thank you for checking by 🙂 The Basler Fasnacht is really a celebration for everyone and the three days you can see Swiss people actually celebrating (we are unfortunately not the wildest bunch of party people 😀 ) If you don’t like to get up early, you can just stay up all night and then attend the Morgenstraich. Just make sure to take warm clothes with you as it is normally quite cold at this time of the year. You weren’t kidding when you said your video of Chienbäse would give a better idea — that really said it all! That was crazy! I wonder if anyone ever gets hurt. It did remind me, however, of the Easter celebration we attended in Oldenburg, Germany, where they built a huge bonfire to “burn out the old memories” and welcome Spring. This carnival looks so much fun! I love the costumes the faces are so wacky! The lantern festival looks beautiful and interesting with political pictures on them, I would like to see that some day. Also I love cheese and onion tart so I must head to Basel! Hi Lucy, thank you for your comment. The carnival is really one of my favourite things to do in Basel 🙂 The cheese tart tastes best when you got up at 3 a.m. to see the Morgenstraich and have it as breakfast afterwards! Basel is widely acknowledged as Switzerland’s city of culture and for obvious reasons. Just look at these pictures I say! I must have been asleep when I worked in Switzerland! I was there for 3 years and have never heard of this! I was in the French part, but that’s no excuse for missing something as fun as this! It looks like a great time! Hi Andi, nice to read you 🙂 Don’t worry, you haven’t been asleep, you just experienced a thing called “The Röstigraben”. It’s basically a cultural gap between the French and the German speaking part of Switzerland 😀 At least you have something worth coming back to. I have been to Carnival celebrations in New Orleans and Quebec City. I had no idea Switzerland could party like this. Wow, this looks like an amazing carnival. It’s always fun to visit a place when you can really get to know the culture and the people through events like this. I’d love to plan a trip to Basel, and think I’ll consider going for the next Basel Fasnacht. Hi Lois, thank you for reading our post. As I grew up in the region of Basel, the Fasnacht was always my favourite festival! The one thing i love most about it are how friendly everyone is at this time 🙂 I’m sure you’ll enjoy your trip to Basel if you decide to do it.